TFL HOBBY ELECTRIC BRUSHLESS LIPO ARTR REMOTE CONTROL FIBREGLASS RACING BOAT. Extremely fast, definitely not for the kids. Just bolt on the rudder, propeller, add batteries and you're ready to race. Spare parts available for this boat. High performance power cat racing Boat. Hand laid all fibreglass construction. Water cooled 33,000RPM brushless engine. Fully installed 125 Amp Water-cooled ESC. Precision CNC alloy rudder, Nylon 2 blade chopper propeller. This Power Cat version comes fully equipped and ready to go (minus batteries). The package includes the beautifully rendered fibreglass hull, in the belly of which sits the massively powerful 33,000 RPM Brushless In-Runner engine. The boat has all the race bits bolted on in the factory including, Teflon Shaft Liner, Water-cooling Jackets, Water-cooled 125 amp Brushless ESC etc. The whole lot is fully assembled including the driveline and all the radio gear. Speaking of radios, the Power Cat comes with the new 2.4 Gig Digital Radio. Because the hull is a work of art to look at when its not in the water, it's only fitting that a laser cut embossed boat stand is provided to show the thing off. New 2015 Model Brushless Power Cat Race Boat. 33,000 RPM 2881 KV Water Cooled Motor (installed). Fully Installed 2.4 Gig Digital Radio. 125 Amp Water-cooled Electronic Speed Controller. Hand Laid All Fibreglass Construction. Nylon 2 Blade Chopper Propeller. 99.9% Ready to run right from the box, just bolt on rudder, prop, add batteries and that's it. Boat Type: Brushless Electric Bullet Race Boat. Hull Material: Hand Laid Fibreglass. Power plant: Brushless Water-cooled 2726 KV 33,000 RPM Race Engine. Propeller: Nylon 2 Blade Chopper. Radio: 2.4 Gig Digital including Pistol Grip Transmitter, Receiver and Steering Servo. Fibreglass Brushless Power Cat Race Boat. Water-cooled Brushless 2726 KV 33,000 RPM Race Engine. 125 Amp Water-cooled Brushless ESC. 2.4 Gig Digital 2 Channel Radio Control. All Fully Installed at Factory. Requires: 8xAA Batteries for Transmitter, 1xLIPO 14.8V 4200mAh 35C 4cell T plug for Boat and LiPo Balanced Charger. THE ESSENTIAL GUIDE TO RC CARS. LATEST NEW VERSION WITH COLOUR PHOTOS. Over 100 pages of Tips, Tricks and Fast Troubleshooting. An essential guide for anyone with an RC Car. Exactly How Long to Charge For Maximum Run Times. Types of Battery Chargers, Fast Chargers, Field Chargers. Types of Batteries, Li-Po, Alkaline, NiMH. Battery Voltage and Cell Count. Don't use Li-Po Batteries until you read this. How does a Brushed and Brushless Motor Work. Electronic Speed Controls (ESC's). How to start a Nitro Engine. How to break in a new engine for Maximum Power. How to Tune a Nitro Engine. How to adjust Mixture settings for optimum power. The best and simplest hotups for more speed and better acceleration. Suspension Camber / Caster Angles and how to adjust. Choosing the right Glow Plug. Adjusting Idle, Low Speed Mixture and High speed mixture screws. Note: This offer is for the Licensed Colour Instant Download Version. We do not supply a hard copy. Note: We are unable to sell Lithium Polymer (LiPo) powered vehicles and/or batteries to international customers, Australian customers only. Our direct deposit details are provided at the end of Checkout. This vehicle is either Ready to Race, or Almost Ready To Race (refer to Features section). We stock spare parts for this vehicle. 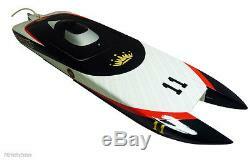 The item "TFL HOBBY ELECTRIC BRUSHLESS LIPO ARTR REMOTE CONTROL FIBREGLASS RACING BOAT" is in sale since Monday, July 22, 2013. This item is in the category "Toys, Hobbies\Radio Control\Vehicles". The seller is "rchobbyestore" and is located in Sydney.